Deceit and Denial details the attempts by the chemical and lead industries to deceive Americans about the dangers that their deadly products present to workers, the public, and consumers. Gerald Markowitz and David Rosner pursued evidence steadily and relentlessly, interviewed the important players, investigated untapped sources, and uncovered a bruising story of cynical and cruel disregard for health and human rights. This resulting exposé is full of startling revelations, provocative arguments, and disturbing conclusions--all based on remarkable research and information gleaned from secret industry documents. This book reveals for the first time the public relations campaign that the lead industry undertook to convince Americans to use its deadly product to paint walls, toys, furniture, and other objects in America's homes, despite a wealth of information that children were at risk for serious brain damage and death from ingesting this poison. This book highlights the immediate dangers ordinary citizens face because of the relentless failure of industrial polluters to warn, inform, and protect their workers and neighbors. It offers a historical analysis of how corporate control over scientific research has undermined the process of proving the links between toxic chemicals and disease. The authors also describe the wisdom, courage, and determination of workers and community members who continue to voice their concerns in spite of vicious opposition. 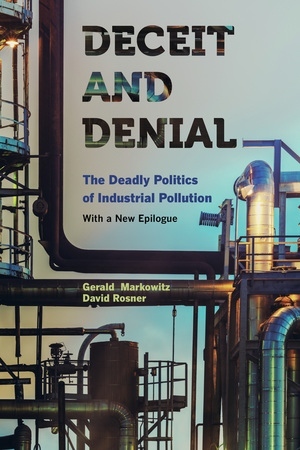 Readable, ground-breaking, and revelatory, Deceit and Denial provides crucial answers to questions of dangerous environmental degradation, escalating corporate greed, and governmental disregard for its citizens' safety and health. After eleven years, Markowitz and Rosner update their work with a new epilogue that outlines the attempts these industries have made to undermine and create doubt about the accuracy of the information in this book. Gerald Markowitz is Professor of History at John Jay College and the Graduate Center of the City University of New York. David Rosner is Professor of History and Public Health at Columbia University and Director of the Center for the History and Ethics of Public Health at Columbia's Mailman School of Public Health. They are coauthors of Children, Race, and Power: Kenneth and Mamie Clark's Northside Center (1996) and Deadly Dust: Silicosis and the Politics of Occupational Disease in Twentieth Century America (1994). They are coeditors of Dying for Work: Safety and Health in the United States (1987) and Slaves of the Depression: Workers' Letters about Life on the Job (1987). 5· Better Living through Chemistry? 8. 01' Man River or Cancer Alley?